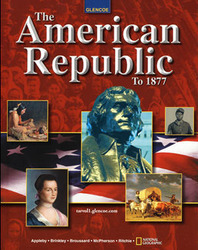 The American Republic to 1877 immerses middle school students in the rich early history of their country. The program includes the finest scholarship and the most up-to-date maps from the world-renowned National Geographic Society. Exclusive! Foldables--student-made three-dimensional graphic organizers--are a unique strategy that helps students read effectively and also can be used as assessment or study tools. Students of any ability can create Foldables, and as they work with these manipulatives, they are fully involved in learning, studying, and reviewing important concepts. A Guide to Reading, Reading Checks, and a Summary in every chapter keep students on track as they learn to read for information and process what they've read.